Design is in the genes of Galia Lahav who grew up in a family of seamstresses in Russia. She launched her brand as an embroidery and knitted applique shop in her very own hometown but quickly began to design for brides. In November 2016, Galia Lahav was granted couture status by the prestigious Chambre Syndicale de la Haute Couture. With an eye for beauty, details, and embellishments, Galia Lahav wants to make every bride feel like a superstar on the red carpet. Craftmanship, attention to details and intricacy are within the DNA of the brand, and hours are spent creating one final look. Approx. 1000 embroidery designs are created for just one final look. And the result is exquisite, feminine and fierce, it is easy to see why Galia Lahav is adored by both a strong celebrity following as well as fashion editors alike. 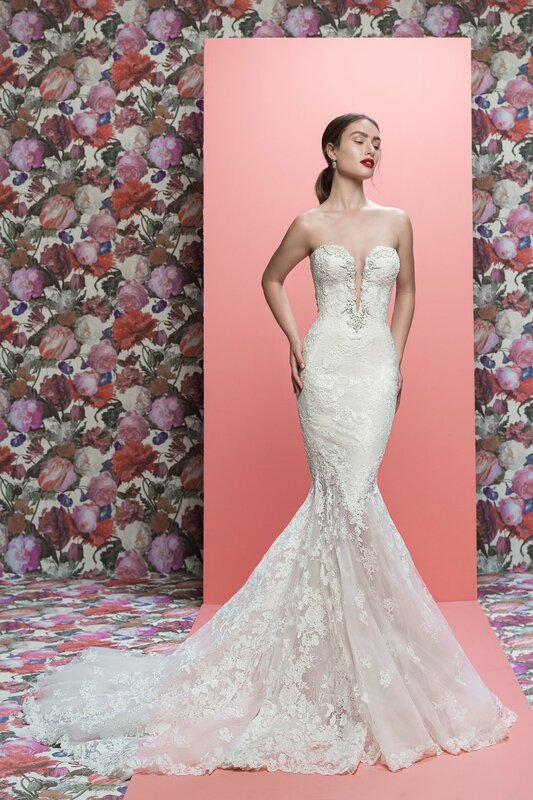 For Bridal Spring 2019, Galia Lahav presented a charming, feminine and lavish collection that offered everything from feminine grand ballgown to detailed embellished mermaid dresses that would do well on the red carpet as well as down the aisle. Galia has an eye for details and the Bridal Spring 2019 collection was no exception. 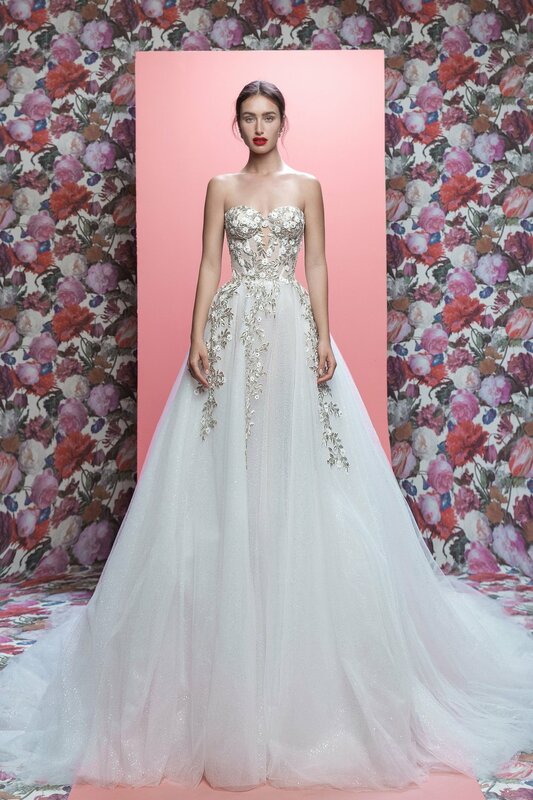 With clever cut-outs, large and luxurious appliques, textile choices and beading, Galia Lahav managed to make every single gown stand out. 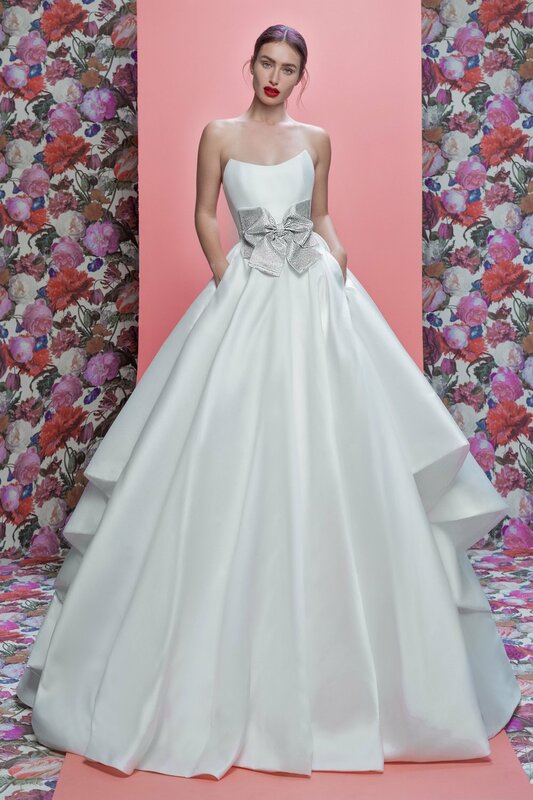 The ballgown with a shimmering skirt and floral appliques and a small cut-out and the lace gown with a deep plunging V-neck with beaded straps and bodice were exceptional on so many levels. Her simple ballgown with a bow at the waist is delightful and charming. The lace a line with a deep V-neck embellished with floral appliques are romantic, glamorous and feels like old Hollywood. Galia Lahav is a master at her craft. Each passing season that mastery pushes her to a legendary status among the current crop of exceptional designers.